Blend between two effects loop using the foot treadle of an expression pedal shell. Toe position is effects loop A and heel position is effects loop B, in the middle of the foot treadle's travel is 50% effects loop A / 50% effects loop B. Either effects loop will default to a clean channel if nothing is plugged into it to allow for blending one effects loop with clean for a wet/dry blender. Phase reversal switch on effect loop A to allow for matching the phase of different effects pedals' outputs. The true bypass switch is activated by pushing down at the toe down position. 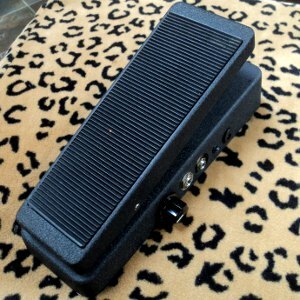 The Dual Effects Loop Blender is 10" long x 4" wide but the jacks are on both sides, effects sends and returns on the left and in, out and DC power on the right. NOTE: The pedal shells will take about a week after placing your order to get in stock so expect a turn around time of about 2 weeks.